Buy your Helicopter Supplement with your Ground School & Test Prep Course and save $30! Once you become a helicopter pilot, you'll fly backwards, sideways and hover! And ... do pedal turns while operating out of an area no bigger than a back yard! 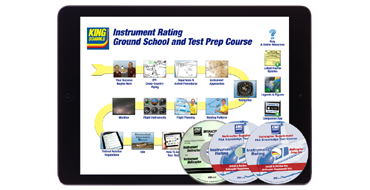 The Instrument Helicopter Supplement Course On-Disc for Windows PC works in conjunction with the Online KING Instrument Rating Ground School & Test Prep Course. Together they cover everything you need to ace your Helicopter Instrument Written Exam (Knowledge Test), including all helicopter instrument test areas and all available FAA helicopter instrument questions, answers and detailed explanations. Supplement Supported Operation Systems: 32 and 64-bit versions of Windows XP, Vista, Windows 7, or Windows 8.